Pure K9 premium optic crystal Eclipse award. Free standing with the front side slightly slant. Simple and Elegant. Available in three sizes. 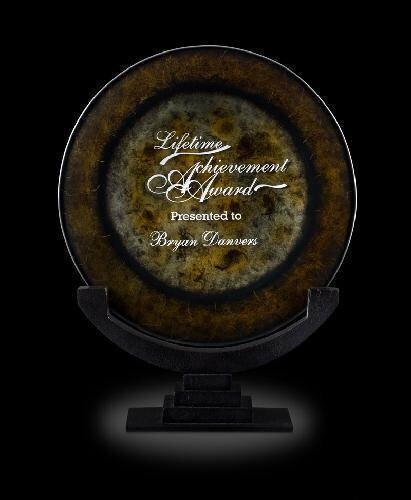 A clear acrylic award with an ascending arc attached to a piano finished rosewood base. Front and reverse laser engraving ready. Ask about attaching a gold or silver plate to the base. Perfect for any recognition or award ceremony, including sports, corporate or educational applications. A faceted diamond of clear acrylic with a marble screen print that sits on a piano finished rosewood stand. The diamond can also be displayed horizontally. Front and reverse laser engraving ready. Perfect for any recognition or award ceremony, including sports, corporate or educational applications. This Elegant Summit Award features a half clear, half screen-printed marble piece that slides into a piano finished rosewood stand. This item will arrived separated and can easily be assembled by sliding the acrylic piece in to the slots on the wood stand. Perfect for any recognition or award ceremony, including sports, corporate or educational applications. A faceted diamond of clear acrylic that sits on a piano finished rosewood stand. The diamond can also be displayed horizontally. Front and reverse laser engraving ready. Perfect for any recognition or award ceremony, including sports, corporate or educational applications. A flame shaped acrylic piece half clear, half marble screen-printed, attached to a piano finished rosewood base. Front and reverse laser engraving ready. Perfect for any recognition or award ceremony, including sports, corporate or educational applications.